As the year 1776 came to a close, MARGARET HILL MORRIS confessed to fluctuating emotions: pity for the soldiers of all sides and gratitude that her family had a roof over its head. On December 27, news was received about an action that took place on Christmas night. Here is what she wrote in her journal. Washington had had an engagement with the Regulars on the 25th early in the Morning, taking them by surprize, killd fifty, & took 900 prisoners. The loss on our side not known, or if known, not sufferd to be publick.—It seems this heavy loss to the Regulars was oweing to the prevailing custom among the Hessians of getting drunk on the eve of that great day which brought peace on Earth & good Will to Men—but oh, how unlike Christians is the Manner in which they Celebrate it, can we call ourselves Christians, while we act so Contrary to our Masters rules—he set the example which we profess to follow, & here is a recent instance that we only profess it; instead of good will, envy & hatred seem to be the ruling passions in the breasts of thousands. This evening the 27th about 3000 of the Pensylvania Militia, & other Troops landed in the Neck, & marchd into Town with Artillery, Baggage &c, & were quarterd on the inhabitants, one Company were lodged at J Vs & a guard placed between his house & ours, We were so favord as not to have any sent to our House. An Officer spent the Evening with us, & appeard to be in high spirits, & talkd of engaging the English as a very triffling affair, Nothing so easy as to drive them over the North River &c—not considering there is a God of Battle, as well as a God of peace, who may have given them the late advantage, in order to draw them out to meet the Chastisement that is reservd for them. 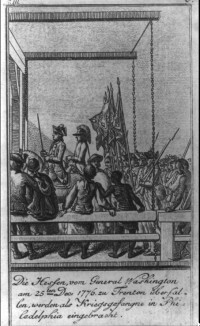 As shown in the illustration, captured Hessian soldiers were paraded through the streets of Philadelphia. It was hoped that their appearance would boost morale and aid in the recruitment of Continental soldiers. The passage comes from In the Words of Women, page 101. The illustration of the captured Hessian soldiers can be found here.